Today, roughly 40% of the vehicles on the highway have receiver hitches – and although they are necessary for towing – they reduce rear end collision damage and INCREASE the risk of whiplash by creating a stiff "crash pulse". In a European study by Chalmers with data from Folksam and Autoliv they concluded that a vehicle equipped with a receiver hitch (tow bar) increases the risk of whiplash by 22% if it is hit in the rear. And in the United States the most frequent vehicle accident is the rear end collision. For those of you who are not familiar with the towing industry the “receiver hitch” is the part of a towing package that is bolted to the rear frame of the vehicle. Typically they are found on pickup trucks and larger SUVs but can be mounted on most any vehicle capable of towing. They can be rated from a Class I to a Class V type depending on the kind of weight you will be towing. Class 1 hitches being the kind that would tow less than the Class V type. The typical Class V hitch can tow trailers up to 10,000 pounds or more. 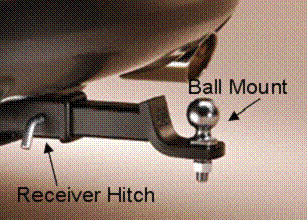 A “ball mount” is the part that slides into the receiver hitch and allows you to tow the trailer. Ball mounts can be fitted with a 1 7/8", 2” or 2 5/16" ball for towing. Sometimes other types of ball mounts like the "Pintle hitch" can be used instead of the typical ball mount. Receiver hitches have been shown to take impacts up to 5 mph – with the vehicle sustaining NO damage. Videos and documentation from the Insurance Institute For Highway Safety (IIHS) have proven that. The IIHS now removes all receiver hitches when they do their rear bumper testing because receiver hitches prevent damage to the rear of a vehicle, so in order to get a fair comparison of bumper performance they remove them before they do any rear crash tests. In a rear end collision involving a vehicle equipped with a receiver hitch, the crash energy is transferred directly to the frame of the "target" vehicle and then to the occupants. This isn't rocket science. If you bolt a steel beam (receiver hitch) to the steel frame rails of a pickup truck or SUV – you're going to create a stiffer "crash pulse". A receiver hitch completely changes the crash dynamics. It has been shown that the occupants of the "target" vehicle will move forward at 2.5 times (or more) then that of the "bullet" vehicle. So a small 5 mph impact will send the occupants of the target vehicle flying forward at 12 – 13 mph – certainly enough force to hurt people. This change in acceleration or "Delta V" is what influences whiplash. According to this European study, rear-end collisions resulting in changes in acceleration below 12 mph constitute the major part of crashes resulting in neck injuries. The entire towing industry focuses on towing safety, however it should be the number one priority. The average person tows less than 1% of the time and according to the Specialty Equipment Market Association (SEMA), 25% of the people that have a vehicle equipped with a receiver hitch don’t tow a thing. So having a vehicle equipped with a receiver hitch is a huge liability when it increases your risk of whiplash by 22% - especially when women and children are already two times more likely to get injured from whiplash then men (their necks are not as strong). If you are involved in a rear end collision and you have a vehicle equipped with a receiver hitch chances are that the damage to your vehicle will be minimized. Although you may think this is a good thing, the biggest problem arises if you want to make an injury claim. Your insurance company will argue that since there is little damage to your vehicle, you could not have been injured – and that couldn't be further from the truth. For the insurance company it's a win, win situation – they don't have to spend as much money fixing your vehicle and it makes it more difficult for you because low impact crash cases are becoming increasingly more complex and harder to prove when they show little damage. You can decrease the risk somewhat by simply removing your ball mount, bike rack, cargo carrier or any other "fixed" or static (non-energy absorbing) receiver hitch product after use. It is a good first step in reducing the potential for whiplash because these products simply move the risk of whiplash outward. But the real problem still remains – the receiver hitch. The rear end collision is on the rise with all the distractions but there are energy absorbing products on the market that you can install into your receiver hitch that will soften the crash pulse and make your receiver hitch safer. Do your homework because you really cannot afford to be without one. Approximately 75% of all rear end collisions are less than 10 mph. 56% of all rear end crashes are straight on. It is better to have under-ride than over-ride. Under-ride will give lower acceleration in the first part of the crash. The acceleration of the occupant when hit from the rear is 2.5 times or more then that of the bullet vehicle. 94% of all rear end collisions occur on straight roads. Women are twice as likely to end up with a whiplash injury as a man. 32.1% of all fleet injuries are caused by the rear end collision.